Learn and train the sushi techniques used by Japanese sushi chefs in Tokyo. 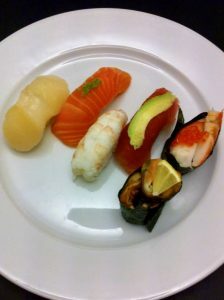 In 2012 I was introduced to a nigiri technology that takes 20 years to master. It is technique where you shape the individual rice grain in a way so that they melt in your mouth when you take the first bite of a silky but firm nigiri sushi. At this course you will get the opportunity to adjust and refine your nigiri technique while introducing to unknown fish species. These are fish species that you do not even find on a menu at sushi restaurants. It will be some exciting hours where we will take a dipstick deeper and work with challenging cooking techniques. You get an introduction to what the difference is between authentic Japanese nigiri and Japanese Sushi chef’s take on nigiri. You are introduced to two different challenging Danish fish which require precision in filleting. You fillet fish so they have a high enough quality which makes them suitable for being used for sushi. You use several different Japanese cutting techniques since the structure of a fillet will be different from fish to fish. You train and get refined your hand techniques to get more routines and make nigiri of a higher quality. You filleting 2 different challenging fish that are not found on the menu in sushi restaurants. You train cutting techniques and hand techniques with 4 different fish. The course is held a few times a year.